Unlike some of its fellow NewSpace companies, Blue Origin keeps a very low, even secretive profile about its activities. The company, founded and funded by Amazon.com founder Jeff Bezos, has gained a reputation for saying very little about what it’s up to. ““We like to talk about things after we’ve done them, and not before that, and hopefully you’ll be hearing a lot from us in the future,” Brett Alexander, director of business development and strategy at the company, said at a human spaceflight symposium in October at the US Naval Academy. And, earlier this week, we did hear a little more from Blue Origin. The company held a rare teleconference with reporters tied to a press release—itself a rare event—about the latest tests of the company’s BE-3 engine. The engine, which uses liquid hydrogen and liquid oxygen propellants, will power the company’s New Shepard suborbital vehicle and, eventually, the upper stage of a planned orbital launch vehicle. Blue Origin said it has fired the engine more than 160 times to date, with a cumulative burn time of 9,100 seconds. 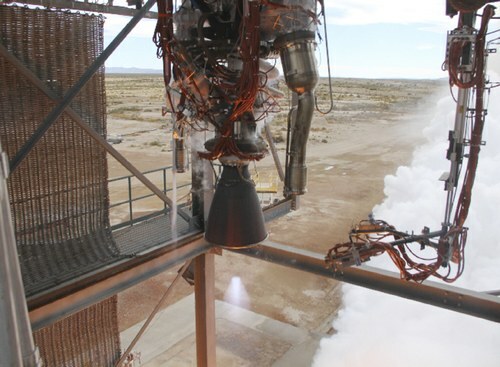 In the test highlighted by the company in its Tuesday announcement, the engine performed a “full mission duty cycle” of the type it would perform if being used a New Shepard flight. The engine fired at full thrust (490,000 newtons, or 110,000 pounds-force) for 145 seconds to simulate the boost phase of the flight, then shut down for four and a half minutes before firing again at less than a quarter of its boost phase thrust to simulate a powered landing. Blue Origin conducted the tests at its facility north of Van Horn in west Texas. The test, Blue Origin president Rob Meyerson told reporters Tuesday, was part of the company’s unfunded extension of its Commercial Crew Development phase 2 (CCDev-2) Space Act Agreement with NASA. “This was one of the three milestones in our unfunded CCDev-2 agreement,” he said. The other two, he added, are reviews of cryogenic propellant tanks for New Shepard and an interim design review of the company’s orbital space vehicle. The upper-stage version of the BE-3, dubbed the BE-3U, would be at least slightly different from the BE-3 that powers Blue Origin’s suborbital vehicle. The BE-3U will feature a different nozzle to account for the different expansion ratio at higher altitudes. Meyerson said there could also be other manufacturing changes to the BE-3U since it is designed to be an expendable engine, while the BE-3 used for New Shepard is reusable.